Click on the map for a larger version (in a new tab). Here are a couple of specific lists that are worth remembering. As anyone with any sort of grasp of Middle Eastern politics should be aware, Egypt's eastern border is with Israel. Note also that Morocco has a coastline on the Atlantic Ocean, as well as one on the Mediterranean. Note that in the above table, each country has borders with the countries that come both before and after it. I have a mnemonic (which I made up myself) to help me remember the Central American countries. For the five countries with Pacific and Caribbean coastlines, it is: Peter Cushing Naturally Hates Garlic. To include the two that only have coasts on one side, I extend this to: Peter Cushing Naturally Hates Eating Garlic Bread. The first list (and its mnemonic) takes us right through the isthmus, from Colombia to Mexico. (It's well worth remembering, by the way, that the South American country that borders Central America is Colombia.) 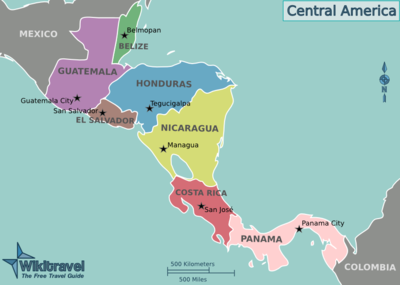 If we want to place El Salvador and Belize precisely, we need to remember that El Salvador is on the Pacific side and Belize is on the Caribbean side. We should also remember that Belize does have a border with Mexico. This could all be a bit mind–blowing, and it's not really clear on the world map above. So here's one (stolen from Wikitravel) that should help; and it even marks the capital cities. If you want to test yourself: I found this quiz quite clever. It also includes the larger Caribbean countries. Known in its own language as Hrvatska; top–level internet domain name ".hr"
Postage stamps are marked "Magyar Posta"
Calendar: months not named but are known as 1st Month, 2nd Month, etc. Gained independence from Serbia in 2006; name means "black mountain"
Name (coined 1933) means "land of the pure"
Described by Winston Churchill (in 1907) as "... truly the Pearl of Africa"